As someone from Kansas, I’m deeply interested in the Flying Spaghetti Monster (FSM.) What’s the connection? Well, in 2005 a very interesting letter was written to the Kansas State Board of Education during a time where the board was deciding whether to add creationism and intelligent design into school curriculums or not. In the letter, Bobby Henderson (the creator of the FSM) advocates for the inclusion of the FSM into the curriculum as well. You can read the rather humorous letter here. A year later, Henderson published the Gospel of the Flying Spaghetti Monster, the FSM Bible if you would. What followed was an internet explosion of support and gain of followers. News stories of people fighting for the right to wear noodle strainers on their head in I.D. photos as religious headwear and pirates officiating weddings found their way on to my newsfeeds. Depending on where you live, the religion is considered legitimate or illegitimate. Here, you can read an article from Harvard Divinity school reporting how a judge in Nebraska decided that the religion was actually a “parody.” However, here you can read an article from the Huffington Post about a woman in Massachusetts who was able to wear a noodle strainer in her license photo. 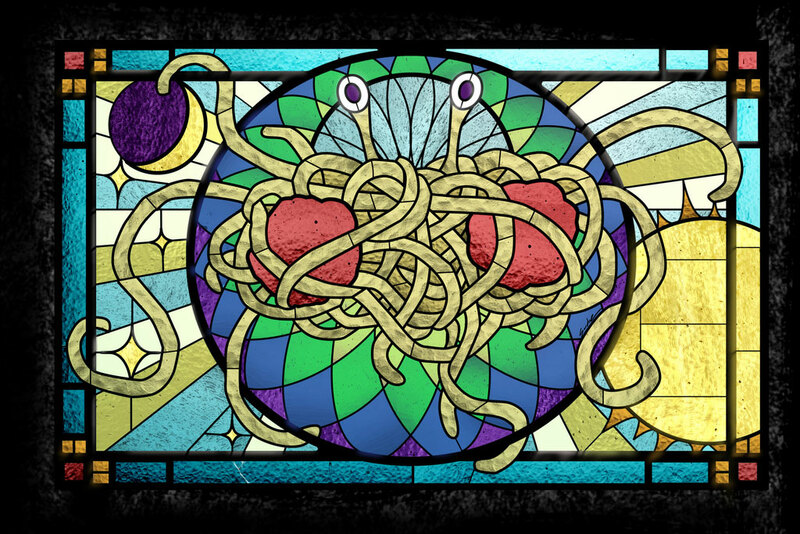 Which brings us to the relevant topic today, is the Church of the FSM a real religion? More on that later. So, how was the book? I’ll break this down in several concise ways: content, accessibility, and price. From stripper factories to beer volcanoes, interesting and outright hilarious aspects of FSMism are discussed. With the theory of gravity (how the FSM is just holding everyone on Earth with his “noodly appendages”) and the theory of evolution (we share more DNA with pirates than we do monkeys, therefore, we came from pirates) one can have a grand time reading the books attempt at highlighting what the author feels are the fallacies of prochronism and fundamentalist theology. The whole thing feels and reads like a satirical critique of the philosophical arguments espoused by famous evangelicals and fundamentalists. It takes itself seriously as much as it does the very philosophies it seeks to utilize to make its point, which isn’t very serious at all. Each page has you flipping to the next as you become engulfed at trying to figure out what point it will make next, which is why, due to its ability to keep you captivated, that I believe it has splendid content. One thing I noticed is that, when reading religious texts, you have to be very careful about history, the intent of the author, context, and so on. With this book, Henderson makes very clear what he is trying to advocate with a language that is more than easy to comprehend. He doesn’t waste time trying to use language that is above one’s head and he doesn’t try to pass the book off as something that it isn’t. The book is accessible to people with a high school education, perhaps lower, which I believe lends itself some of its popularity because nearly anyone can read it. As of right now, the day that this review is released, these are the prices of the book on Amazon. Naturally, these all would include shipping, but this is a truly affordable book. I received the paperback version and it is of great quality. The book holds together quite nicely, and all of the words and images are printed with great detail. I would definitely recommend this book. It really is an exercise in critical thinking and helps one to see that others might not see things the same way as you do. However, this isn’t for the faint of heart. If you are the kind of person who thinks people can’t joke about religion then I definitely would advise staying away. For those who appreciate criticism and see it as a way to help foster dialogue about areas of philosophies that need strengthening, definitely read the book. Returning to the question I raised earlier, is Pastafarianism a real religion, I say: why not? While studying religions, it is obvious that there are certain components that make up a religion. Perhaps this is a cult, a religion, or a social movement, but it cannot be denied that it is possible that there are very serious adherents. Just like the author of this book points out on his website, there are Christians who don’t believe every word of the Bible but are still Christian. They are not considered less Christian because they believe differently than their fundamentalist counterparts. He argues that the same diversity and forms of belief that occurs in other religions may be present in his own and that this is to be expected with religious worldviews. Ultimately, it seems that the quest for attaining legitimacy in the eyes of others will be something Pastafarians will have to continue to face. I, however, will be cheerleading them on in the background as I believe that they should be respected as much as any other practitioners of more established, monotheistic religions. Oh and here’s some great “propaganda” that the official website said people can use! Braidon Beard is the blog writer and founder of Religiosity. Beard is currently seeking a degree in communications with an emphasis in human communication and a minor in philosophy. Beard hopes to become a professor one day that specializes in the role of rhetoric in religious conflict. Fantastic review, thanks for sharing! Reblogged this on Doctor Spaghetti. Thank you for taking the time out of your busy day to read, listen, and watch Religiosity. If you like religion, philosophy, and learning about other worldviews then you are in luck because that is just a fraction of what we hope to do. We hope that as you read the articles, listen to the podcasts, and watch our videos that you will come to appreciate religion and the way it affects us more deeply.